Here is my round scallop for Mojo Monday . I love working with purple and green, it always works up very springy, it's icy cold here today, aren't we glad for the seasons, so we always have something to look forward to. 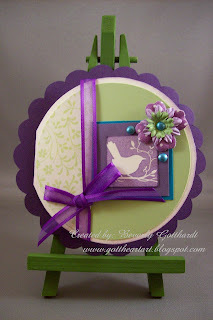 Supplies: Cut round scallop from a white scallop from Paper Cuts, patterned paper unknown, the rest Stampin Up, Stamp: Stampin Up-Of The Earth, Ink: CTMH-Z2161 Petal, Prima Flowers, brads, ribbon-Offray, Fiskars shape cutter template-Circles-1, glue dots. kinda hard to choose between this one and the oval, but I think this one wins simply because I love purple LOL! hey Beverly...a bunch of new cards and they are all great! I can't believe how many you've made just this month....you are cookin' up a storm!!! two great challenges all rolled into one--awesome job!! Thanks for playing along with the CTD challenge! !